Isn't that less than a year? You have been a member for 6 years. 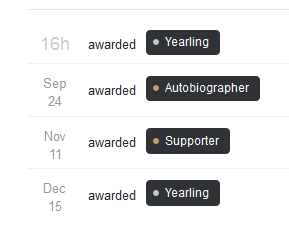 For the Yearling badge, you also need to earn 200 reputation per year. This means that you will get the badge awarded whenever you earn 200 more reputation, up until you've received the badge an amount of times equal to the amount of yours you've been a member (currently 6).